Grogmaster Blog: Getting Board-Gamey with Board Games #1: Board Games! I enjoyed this a fair bit for its innovation and also in the “methadone for Magic: the Gathering” sense. The combos are for the most part simple but can be rewarding to pull off. Also, the Chapel deck. Cait was not particularly drawn in, however, and will tolerate but not request this one. 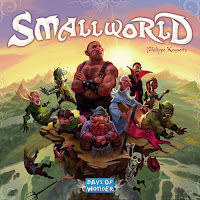 We gave Small World a few plays, since it had been sitting on the shelf since its Spring release. We both like conflict and territory games and, although Small World is not a wargame, it has some (at least surface) similarities: each player controls a fantasy race that occupies parts of the Small World map, and during your turn you conquer even more territory with your pieces. Small World’s differentiating mechanic is that you can chose to abandon a battered race to the fates and start over on your next turn with a new, fresh one. Though the random pairings of races with bonus abilities is clever and lends a bit of replayability by making each game slightly different, we’ve been overall unsatisfied. Small World’s strategic choices seem limited and its conquest is far too sterile. Other than a single, last-chance die roll at the end of each turn, you conquer territory merely by committing the required number of units. 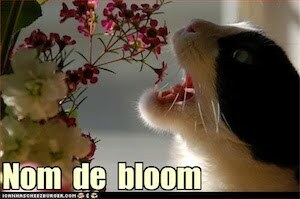 If you have enough, you’ll win the space. Cait and I both prefer the suspense, surprise, and thrill of deciding battles based on dice rolls. A defender who holds off wave upon wave of attackers with luck alone adds excitement to the evening. 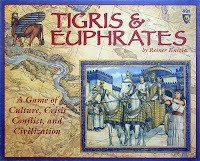 I convinced Cait to give Tigris and Euphrates — considered one of game design legend Reiner Knizia’s masterpieces — another go. We didn’t even make it through one game. Whatever makes this game great does not seem come across with two players, at least not two players who have not played the larger game and don’t know what they’re supposed to be doing. I think our problems with this are similar to the problems we had with Java: the game comes across as a series of mechanics, with no overall guidance on how to play it. Though I’m reasonably content to lay down tiles and see what happens, Cait doesn’t have as much fun if she can’t find at least some strategy to execute. 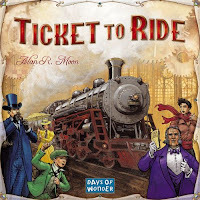 The surprise hit of the past few weeks has definitely been Ticket to Ride. 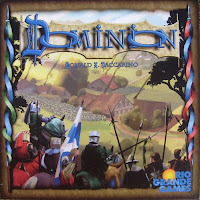 We’ve had this for quite a while (it was an early purchase due to its place among the Three Gateway Games alongside Settlers of Catan and Carcassonne) but it’s gone though a bit of a Renaissance for us. Players are brought into conflict with each other around the seven endpoints. Though Cait and I aren’t particularly cutthroat with each other, knocking elbows keeps the game from feeling like multiplayer solitaire. Our past few games have all been down to the wire, with train counting and big ticket gambles that have both succeeded and failed. We’re also evenly matched, which is more fun. The last two nights that we played it we were enjoying ourselves so much that we went three games back-to-back, which is somewhat rare for us for a game of this length. Check out my BoardGameGeek badge to the right to see what else we’ve been playing, and come back next time for some more capsule reviews.